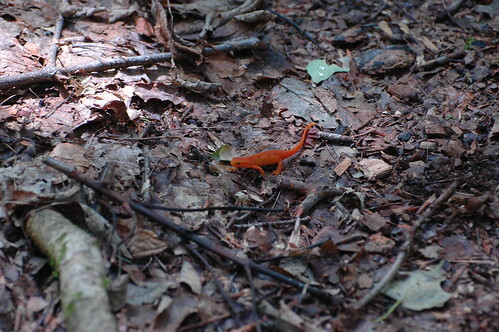 While hiking at Allegany State Park, I came across two Red-spotted Newts. These salamanders go through three stages: 1) aquatic larval stage that is tadpole-like and body color is greenish yellow, 2) sub-adult, land-dwelling ‘red eft’ (there is a Scrabble word for you Kathy!) stage where round red spots with black borders develop and body becomes reddish orange or sometimes brown, and 3) aquatic adult stage where body turns olive-brownish and tail becomes rudder like. All the photos here are of the second, or red eft, stage. Red-spotted newts are also known as Eastern Newts. 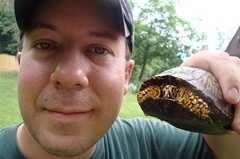 They are common throughout the eastern United States. This entry was posted on 2 August 2012 by patacoate. 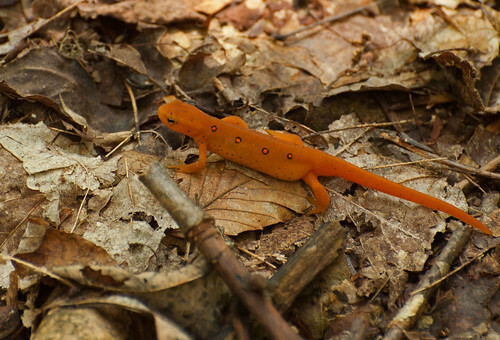 It was filed under iPhone and was tagged with Eastern newt, red eft, Red-spotted newt. What a beauty of nature. I have never seen one like that. These are one of my favorite critters in the whole world.